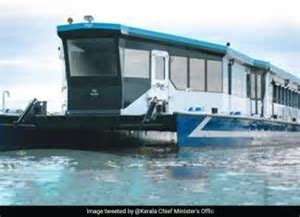 The Kerala government today launched the state’s fastest inland ferry, the Vega 120, connecting the Ernakulam, Kottayam, and Alappuzha districts. “The vessel can reach speeds of up to 25 km per hour, reducing the journey time from Ernakulam to Vaikom to 90 minutes,” the Chief Minister’s Office said in a tweet. Until now, inland ferries operating on Kerala’s waterways could achieve a top speed of just 14 km per hour. The partially air-conditioned ferry comes as a big relief for people in the region, who regularly commute through river routes. The ferry service will be linked to other major points on the route through feeder boats. Owned and operated by the State Water Transport Department, the ferry can carry as many as 120 passengers — 40 in the air-conditioned cabin and 80 in the regular one — with ticket prices fixed at Rs.80 and Rs.40 respectively. Built by the Navgathi Marine Design and Constructions agency, the vessel is said to have exceptionally high safety standards. Equipped with an active fire-protection system, its engine room is completely insulated while the hull and inner deck are coated with fire-resistant resin to prevent accidental blazes. Besides its famed backwaters, Kerala has 41 rivers flowing towards the west — most of them forming a part of the inland transport system running over 1,895 km. The government had recently unveiled plans to establish direct waterway connectivity to three international airports in the state as part of a project aimed at setting up a multi-modal transport system linking air, land and water routes. Be the first to comment on "Kerala launches its fastest inland ferry with AC cabins and the top speed of 25 Kmph"